It’s fall in Virginia, but winter will be here before you know it. Is your heating system ready? Heating and cooling can be a challenge in Virginia’s autumnal months. But once winter arrives, you may have heating bills that are more than they should be. If your heating system hasn’t been serviced in a while, call us today at 804-276-2800 for an appointment. If your HVAC system has been serviced, heating your home may still be costly. Start now, and you’ll be ready when first winter front arrives. Have your heating system checked before you need it. A service check can alert you to problems you didn’t know about, and can prevent costly breakdowns during the winter. Check your heating ducts for leaks, and seal them. Tiny leaks can be expensive! Consider changing your old thermostat to a new, programmable model that allows you to set it and forget about it until spring. Insulating window film can help keep out cold as well as heat in summer, and is less expensive than replacement windows. Change your system’s filters regularly and buy extras so you won’t run out when you need them. Clogged filters make your unit work harder, increasing your heating costs, so keep them clean! Check for drafts: light a candle, and carefully move it along doors, windows and other spots. When the candle flickers, mark each “draft” location (sticky note, etc.) Seal the spots with caulking and/or weather stripping to keep chilly air outside. Even if you’ve replaced your door sweeps, you can also stop incoming air flow with a simple to make Draft Snake. Using heavy fabric and inexpensive dried beans, the Draft Snake is a physical barrier to chilly air (or escaping cool air in the summer.) Use a fabric that matches the décor in each area of your home that needs one. Insulate your attic door. Heat rises, so unless your attic is part of your living space, attic door insulation will keep the heated air inside your home. Do you have a basement? Insulate the basement’s ceiling to keep cold air from seeping upwards. Insulate the walls to add additional living space and keep your entire home warmer. 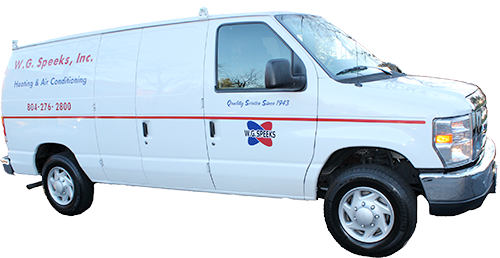 WG Speeks is Richmond, VA’s heating and cooling experts since 1943. Call us today at 804-276-2800 to schedule your home heating system for a checkup and maintenance appointment. Don’t be left in the cold!